There is growing evidence of the serious negative effects that “smart meters” have on health. PSO is busy spreading the installation of these controversial meters in Oklahoma. 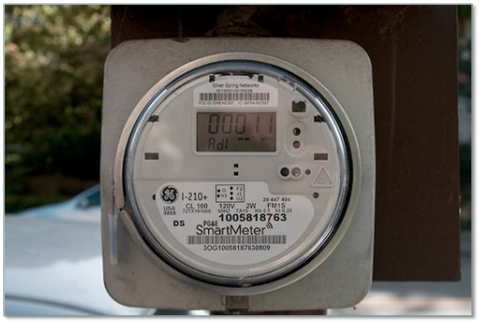 The OK Corporation Commission has a (limited) FAQ page entitled SMART Grid and SMART Meters Information and Resources. OK-SAFE, Inc. – The following flyer provides details on a meeting to discuss and review The Health Dangers of Smart Meters. Please make plans to attend. The meeting is scheduled for Thursday, January 31, 2013 at 7:00 pm in Owasso, OK. Directions below. Join us for the First Public Oklahoma Informational Meeting and hear what YOUR SMART METER is doing to YOU! Jerry Flynnʼs YouTube presentation (a Retired Canadian Armed ForcesCaptain (CFRI), spent 22 years of his 26 year military career in SIGINT, Radio Warfare & Electronic Warfare, presents revealing, unparalleled knowledge in the area of electromagnetic frequencies). Don Powers (attorney) will be presenting Oklahomaʼs prospective concerning Smart Meters. Directions: 301 S. Cedar (Old Fire Station) Exit off Hwy. 169 at 76th St. North, then go West on 76th St. North pass two red lights, turn Left (South) on Cedar St. Go about half a block and the Community Center will be on the Left (East). OK-SAFE, Inc. – The following fairy tale is from a gentleman named Joe from Owasso, OK. Owasso was one of the first places in Oklahoma to install the digital/spy/surveillance/meters known as Smart Meters. Oh, if only the story would end the way Joe has written it. Once up on a time there was a little village named Owasso filled with happy villagers going about their daily lives. One pretty sunny day the BIG LOCAL POWER COMPANY came to town with their NEW AND IMPROVED SMART METERS to measure the power usage on all the little village homes. THEY only told the villagers that the NEW AND IMPROVED SMART METERS would be a new way to measure their homesʼ power consumption and that would help all the village homes save money and be more efficient making every home owner very, very happy for ever after, such JOY. The BIG LOCAL POWER COMPANY and the WISE LOCAL TOWN ELDERS joined together and said the little village would be the pilot study for all the other villages and the whole countryside far and wide. At first, most villagers were happy to have their NEW AND IMPROVED SMART METERS. However some villagers did not want the NEW AND IMPROVED SMART METERS, but they got them anyway. Because the BIG LOCAL POWER COMPANY and the WISE LOCAL TOWN ELDERS KNEW BEST FOR ALL THE VILLAGERS, they where SO, SO, WISE. The BIG LOCAL POWER COMPANY said their NEW AND IMPROVED SMART METERS where SO, SO SMART they did not need a meter reader going from home to home to read those OLD NASTY ANALOG METERS that lasted all those long, long years and were so faithful to the villagers. As time passed in the little village some very s-t-r-a-n-g-e things started happening. The villagers began losing their ZEST FOR LIFE and could not understand what had changed in their little village. Could it be the NEW AND IMPROVED SMART METERS installed by the BIG LOCAL POWER COMPANY??? But werenʼt the NEW AND IMPROVED SMART METERS to help us save money??? Then the villagers discovered what the NEW AND IMPROVED SMART METERS really were, two separate PULSING MICROWAVE RADIATION TRANSMITTERS. The little villagers were never TOLD by the WISE LOCAL TOWN ELDERS or THE BIG LOCAL POWER COMPANY about the DAMAGING EFFECTS to All Biological Life caused by PULSED MICROWAVE RADIATION –Oh what HORRORS!!!. The puzzled villagers began to ask themselves three very important questions: Did the BIG LOCAL POWER COMPANY and the WISE LOCAL TOWN ELDERS know of these terrible effects from the NEW AND IMPROVED SMART METERS??? Could the myriads of PULSING MICROWAVE RADIATION TRANSMITTERS installed all across the village cause sickness to the villagers, the plants and even the cute and furry little animals??? After all, arenʼt microwaves for cooking things??? Sure enough, one villager began having unexplained health problems after the installation of the NEW AND IMPROVED SMART METERS came to the village. After much searching, the villager discovered how to protect himself from the VERY DAMAGING EFFECTS OF PULSING MICROWAVE RADIATION TRANSMITTERS and the villager got all better and his ZEST FOR LIFE returned. Then the villager announced to the whole little village what needed to be done to restore their ZEST OF LIFE — HOORAY!!! ALL the little villagers told the BIG LOCAL POWER COMPANY and the WISE LOCAL TOWN ELDERS — NO MORE — of the NEW AND IMPROVED SMART METERS and to replace them with the Old, Old, Faithful Analog meters on the little village homes. And the Old, Old, Faithful Analog meter with their meter readers were restored to the little village. Then the little villagers’ ZEST FOR LIFE returned again and all the little villagers lived happily ever after. If you are interested in fighting Smart Meters in Oklahoma, please contact Joe Esposito at 918-639-3421. 1/24/13 UPDATE: Thank you to all those folks who called their Congressman on the No Budget, No Pay bill. Unfortunately, H.R. 325 passed yesterday, 285 to 144. “Here are the results of the votes on HR325. It did unfortunately pass with 285 votes for and 144 votes against. We have to give a BIG THANK YOU to Rep. Jim Bridenstine and Rep. Markwayne Mullin for taking a stand against Kicking The Can Down The Road and voting NO on HR325. It is great to see Congressmen who have kept their word and do the right things. OK-SAFE, Inc. – Congress is facing budget decisions that will effect all of us. All five members of the Oklahoma delegation are Republicans who say they are “conservative”. 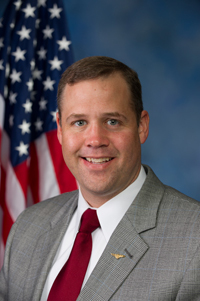 As time goes by, however, it is becoming more and more apparent that instead of five conservatives, we in Oklahoma have one real conservative representing us in Washington – the 1st District’s Jim Bridenstine. Congressman Bridenstine has provided the following statement, detailing his reasons for voting NO on “No Budget, No Pay” deal. Suspend the debt limit until May 19th. Make zero cuts to spending in the deal. Violate the 27th Amendment of the Constitution by “varying” congressional compensation. Let military sequestration take effect, cutting $500 billion from the Department of Defense. Pass a Continuing Resolution codifying federal spending at post-sequester levels. Wait to fight for spending cuts until we hit the debt ceiling again in May 2013. The first part of the “No Budget, No Pay” strategy is to suspend the debt limit through May 19, 2013 with no spending cuts. It seems Republicans have decided not to leverage the debt limit to achieve real reforms. In lieu of cuts, the bill will contain language stating that the Senate must pass a budget or not be paid. This sounds strong, but there will be no clause stating that the Senate budget must place us on a path to fiscal responsibility. Nor will there be a clause stating that the Senate budget must be reconciled with the House budget. This is seemingly just a ploy. American voters do not want the debt ceiling to be raised without spending cuts. A CBS News / New York Times poll, conducted January 11-15, found 60% of all Americans want to see the debt ceiling raised with spending cuts. Only 17% want the ceiling raised without cuts. A Fox News poll reported 69% who say Congress should only raise the debt limit after agreeing on major cuts in spending. A suspension of the debt ceiling is more alarming than an increase. The bill as presented leaves no statutory limit on federal debt. It assumes that the Treasury will not reverse its extraordinary measures, replacing the funds “borrowed” from other accounts by issuing billions of additional debt in the three month interval. That is an assumption that has not been acceptable in the past and is not acceptable today. I campaigned saying I would raise the debt ceiling only if substantial spending cuts or a balanced budget amendment was included. Raising the ceiling without negotiating spending cuts will disappoint voters, putting a lot of pressure on everyone who campaigned on fiscal conservatism or responsibility. Since the Democratic Senate will not go for a 3-month debt limit suspension that ties their pay to a budget, this plan will be spun as gimmicky and not serious. Republicans will not win the public relations effort, but they will be on record voting to allow the debt to increase with no spending cuts. This will alienate the Republican base. The second part of the “No Budget, No Pay” strategy is to let sequestration take effect in March, cutting $500 billion from the Department of Defense. This is intended to put pressure on the Democrats to reform entitlements. Using threats to curtail military funding to create a crisis for the purpose of political advantage is an inappropriate policy. This bad policy also enables the President to continue compromising our national security for a social welfare agenda that restricts economic freedom, punishes achievement, cripples our economy, and makes us less competitive in the world. It should be noted that there are no new savings when we allow the Sequester to take place. These savings were a result of the August 2011 debt ceiling increase negotiation. It should also be noted that using a debt limit increase to control spending has been successful in the past and it will be successful in February 2013 if Republicans are willing to forgo the “No Budget, No Pay” debt limit suspension for a real negotiation. The fourth part of the “No Budget, No Pay” strategy is to have a “real” fight over the debt limit in May. The reality is that if a vote to raise the debt limit ‘clean’ (without spending cuts) comes to the floor, 30 Republicans will join 200 Democrats and there will be no savings realized. My final concern is the most difficult to ignore. “Varying” congressional compensation appears unconstitutional by both letter and original intent. The text of the 27th Amendment was submitted by the Framers as part of the original Bill of Rights in 1789. It was ratified in 1992, 202 years later. If the Framers of the 27th Amendment had simply meant that compensation of Senators and Representatives not be “increased nor diminished” then they would have used that exact phrase as it stands in the Constitution referring to the compensation of the President in Article II, Section 1. Instead, the Amendment is written , “No law, varying the compensation.” Varying the timing of payment is varying the payment. Your banker will testify. We are asking that folks call the other members of the OK Congressman and ask them to vote NO as well. OK-SAFE, Inc. – Using children as set pieces, President Obama today outlined a list of “Gun Violence Reduction Executive Actions” dealing with expanding the ways by which government would have the means to limit people’s right to self-defense and their ability to resist a tyrannical government. As always, the government’s solutions would involve the collection of more data about the American people, and the use of technology. For instance, several of the administration’s recommendations dealt with removing the barriers to information sharing between the feds and state, or other entities, for the purpose of conducting background checks on purchasers/owners of guns (#1, 2, 3, 5, and 6). Another recommendation was to use the CDC (Center for Disease Control) to study the causes of “this epidemic of violence” (#14), which of course will require access to more detailed personal data on people and their mental conditions. Another one suggested amending HIPAA to allow government access the medical records for background checks to see if, well, whether folks 1) have a mental illness and 2) own a gun. (#2 and #16). More information sharing. 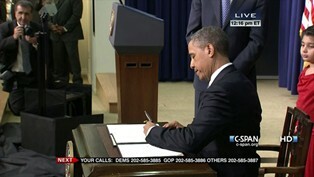 Listed below is the list of Executive Actions sought, as posted by C-SPAN on January 16, 2013.